HSC has integrated a number of services to meet the needs of all our four schools. We strive to provide quality services that enhance the learning environment for students, guests, and other members of the HSC community. At HSC we believe positive food culture is linked to academic performance and a student’s well-being. As a College, we promote high standards of student nutrition—an identified HSC strategic priority. Every day, our HSC culinary team will enhance the preparation of meals from scratch using local Ontario ingredients. Fresh, high-quality ingredients are integral to great food preparation, so we are now sourcing from local Canadian producers, greenhouse growers and dedicated farmers who meet our high standards. Those fresh ingredients, combined with menus customized daily, will ensure the best possible taste experience for our community. For more information click here. HSC’s food services program includes an expanded allergen management program to ensure students with allergies and sensitivities receive safe food options. This is made possible through good relationships with suppliers, who now offer more items to meet the needs and demands of a variety of allergenic and dietary needs. 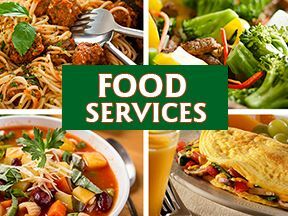 Students with specific dietary needs and allergies know that there is a section in the kitchen where they can come and get safe food. Our faculty members, especially those in early education, work in close partnership with HSC Health Services and the kitchen team. HSC Food Services staff members also take the time to get to know each student and their particular needs or allergies. Rain or shine, sleet or snow—every year HSC bus drivers travel thousands of kilometres to safely deliver HSC students to school. They are the first face many students see at the beginning of the school day, and the last when they depart for home. More than 700 students bus to and from the College every day. Thirty drivers cover 27 individual routes, and the fleet includes two full-time charter buses for school trips, two part-time spare drivers and two noon-hour runs. As College employees, drivers are part of the HSC community, and the College’s culture of excellence is evident in the care they show their young passengers. All of our drivers are certified through the Ministry of Transportation. 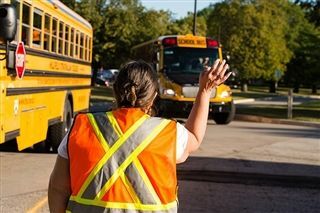 They receive hours of training in how to manage student behaviour, safe loading and unloading of the buses, defensive driving and emergency medical and evacuation procedures. Riding the bus is an opportunity for students to build resilience and independence. Drivers are trained to help new and younger riders adjust, but after a few days of taking the bus, most students fall into a comfortable routine. HSC transportation is included in student tuition. Drivers transport students of all ages, and those who stay on the same route over the years will see many children grow up and eventually graduate. They get to know students, teachers and parents. In the interest of supporting students in a holistic way, HSC Health and Wellness Services strive to meet the physical, social and emotional needs of the students. This is achieved by direct intervention and proactive initiatives and education to support wellness. Resilience and Wellness is a strategic priority at HSC. As part of our commitment to excellence in care, every student has access every day to full time registered nurses. The nursing team monitors and supports the safety, health and well-being of all HSC students, and contributes to the academic success and lifelong wellness of our community. The nursing team often serves as a bridge between the school, the student, the student’s family and community health services. Included in the many onsite services provided by the nurses are prevention activities, care coordination, nursing interventions, allergy management plans and wellness initiatives. There are benefits to seeking assistance for emotional and social issues, and HSC Counselling Services is one of many College resources HSC students can access for support. We offer individual counselling and information on coping skills, and students can learn about different ways to manage stress and overcome obstacles. HSC also connects students with peer support options and our onsite College Counsellor works directly with faculty, the nurses and staff to provide holistic support to our student body. HSC students and athletes have access to first-class facilities and one of the best Athletic Therapy Clinics amongst independent schools in Canada.The HSC Athletic Therapy clinic takes advantage of multiple modalities including ultrasound, laser therapy, Interferential Current Therapy, hydrotherapy tubs, TENS and muscle stimulation. The clinic services all students including a number of varsity and recreational sports, including rugby, soccer, ice hockey, basketball, track and field, and wrestling. Resilience and Wellness is one of HSC’s core strategic directions for 2015 - 2020. We believe resiliency positively feeds into health and wellness, and Health Services team works to prepare our students for life and develop the social, emotional and physical wellness they need to thrive. Every year the College hosts a Wellness Week to engage students, parents, staff and the HSC community in an active exploration of health and wellness related topics. Some highlights of the week include guest speakers, educational sessions, health-based activities, workshops and a Wellness Fair. Wellness Week also provides staff and faculty with additional tools to help students respond resiliently to stress and adversity. During school days, the store is open from 8:15 a.m. - 4:45 p.m. The store will be closed each day between 11:00 a.m. and 12:00 p.m.
During the summer, the store is open Monday - Thursday from 8:15 a.m. - 3:30 p.m. and Fridays 8:15 a.m. - 12:00 pm. 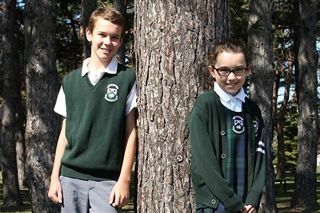 The HSC Parents' Guild (PG) is proud to support the sale of gently-used uniform items at reduced prices. Student-to-student uniform items can be purchased at any time during Campus Store regular hours. All funds raised from the sale of used uniform items go back to the College to support our learning environment. During the school year, the HSC community prepares and performs both musicals and dramatic plays. When a show, or other College-wide event, requires audience members to purchase tickets, they will be available at the Campus Store. Check the promotional materials for the show you wish to attend for information on ticket sales, or contact the Campus Store directly to inquire. The Virtue-Fitzgerald Centre for the Arts has assigned seating for shows requiring tickets. Click Here to view the theatre seating plan.